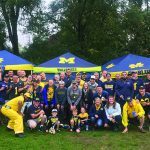 When two evenly matched teams square off on the gridiron a game will often come down to who avoids turnovers and which squad can take advantage of special teams plays. Rockford checked off both of those squares while rallying for a 24-21 win over Hudsonville on Friday, November 2nd at Hudsonville. The win secured the title in the district finals for Rockford as they now advance to regional action at Saline on Saturday, November 10th at 1:00 P.M. against the host Hornets. Rockford and Hudsonville had met at the same venue four weeks earlier with Rockford churning out a grueling 13-7 win. With that prior result and the familiarity the two conference rivals had for each other another close contest was expected. And the game did not disappoint in terms of suspense for either contingent of fans. The Rams had the lead for the majority of the contest before falling behind 21-14 just over two minutes into the final quarter on a 78-yard jet sweep and two-point conversion. The momentum of the contest seemed to really sway over to the Eagles after they forced a quick Ram punt on the following possession. But the resilient Rams used that juncture of the game to make sure they were far from finished. Three plays from the Eagle offense netted a negative five yards and they were forced to drop back into punt formation form their own 20. With just under six minutes remaining in the game the ball was snapped to the Hudsonville punter who rolled to his left for the team’s customary rugby punt. Dylan Dams and Taylor Green sprinted through the line of blockers and converged on the punter and proceeded to cleanly block the punt and send it spinning back into the Hudsonville end zone. The Eagle punter made a smart play by pushing the ball through the back of the end zone and deny a Rockford touchdown but the safety made it a 21-16 game with Hudsonville being forced to kickoff from their own 20. Opting to kick it deep to Rockford the ball was gathered in by Ram senior Alex Miller who returned it to the Ram 43. Three plays netted exactly ten yards and another first down for the Rams. 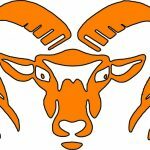 The key play was a third down and five pass from sophomore quarterback Chris Corey to senior tight end Cade Klimczak that got right to the down marker and assured a new set of downs for the Rams. The next play thrilled the Ram partisans and proved decisive in the final outcome. Taking a hand off and sweeping to the left senior halfback Jack Richardson gained the corner and made a sharp cut back to the right while sprinting toward the Eagle end zone. Seeing that he would be overtaken at the ten, Richardson made another cut back to the left at that point and pranced into the end zone to give Rockford a 22-21 lead with 3:58 remaining in the game. Corey then lofted a perfectly thrown pass to 6’6″ senior wide receiver Nate Bareno that was deftly gathered in over the smaller defensive back for a two-point conversion to make the score 24-21. But the excitement was far from over for both teams. Using the same jet sweep that scored the earlier TD the Eagles quickly marched to the Rockford 27 with just under two minutes left. Hudsonville even appeared to get to the Ram six on a completed pass three plays later but a costly holding penalty moved them back to the Ram 45. 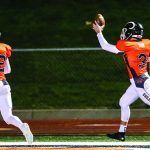 A desperation heave on fourth and 28 was batted down by Bareno two plays later and the jubilant Rams took possession and proceeded to take three kneel downs and run out the clock for the thrilling victory. 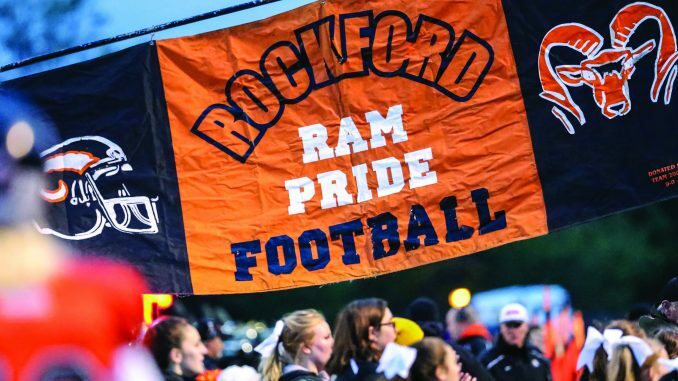 Rockford jumped on top early in the contest as they received the opening kickoff and proceeded to march 60 yards while mixing the run and the pass with equal aplomb. The TD was eventually scored by junior fullback Jaiden Friesen on a two-yard dive with 6:10 left in the opening period. Sophomore kicker Teagen Lenderink added the first of his two PATS to make it a 7-0 Ram lead. Neither team made much of a threat towards the opponents goal line for most of the remainder of the first half and it appeared that score may just hold up as the first half ended. But the Eagles changed quarterbacks and went to the passing game on their final drive of the second quarter. They finally dented the scoring column on a 16-yard TD pass with only :36 left in the half to knot things up at 7-7. It once again seemed that TD would signal the end of the scoring for the first half but Rockford had other ideas. 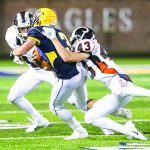 Junior wide receiver Eli Haddad gathered in the ensuing kickoff at his own 13 and bobbed and weaved his way through traffic before finally being brought to a halt at the Eagle 33. A hand off to Friesen netted six yards on the first play and the Rams used their final timeout with 14 seconds remaining in the first half and 27 yards seperating them from the Eagle end zone. Rockford came out with three players split wide to the left and that prompted Hudsonville to use their final timeout to prepare to defend whatever play the Rams opted to use. Rockford made a subtle change in the formation and threw an immediate lateral to Bareno in the left flat. The Eagle secondary came flying up to tackle the dangerous Bareno before he could get going. But Bareno immediately reared back and launched a perfectly thrown pass to a streaking Haddad in the deep left corner of the end zone while completely fooling the Eagle defense. Just like that it was a 14-7 Rockford lead with only six seconds showing on the clock. That ended the first half scoring as the Ram partisans roared their approval. Hudsonville scored on their opening drive of the second half on a one-yard TD run but missed the PAT to leave the Rams with a tenuous 14-13 lead that they maintained into the final quarter. That set the stage for the frantic finish and the Rams emerged with the win to punch their ticket for yet another week of life. Richardson led the Ram rushing attack with 61 yards on seven carries while Friesen added 50 on 16 totes. Corey was 6 for 8 passing for 63 yards while Drew Bareno added 39 yards on a five for eight effort. Nate Bareno was one for one for a TD and 27 yards to complete the three-headed Ram passing attack. Haddad hauled in four passes for 68 yards to pace the receiving corps. Nate Bareno, Richardson and Connor Whit all had two catches for 24,16 and 14 yards respectively. The Rockford defense was led by the usual suspects as Austin Klein showed the way with ten tackles. Ian Rodriguez and Klimczak both chipped in with seven tackles apiece.